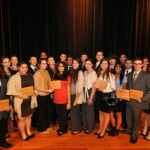 The Young Professionals Chamber of Commerce (YPCC), a program of the Huntington Township Chamber of Commerce, hosted its Ninth Annual Business Leadership Competition at Farmingdale State College on Wednesday, November 30. This year more than 300 high school students from 14 local high schools, including Commack, Deer Park, Farmingdale, Half Hollow Hills East, Half Hollow Hills West, Harborfields, Hauppauge, Huntington, North Shore, Northport, Oyster Bay, St. Dominic’s, Walt Whitman, and Wilson Technological Center participated. A luncheon and awards ceremony followed the competition. The competition provided students with the opportunity to demonstrate their knowledge through presentations in categories including Fashion Marketing, Hospitality Services, Advertising, Graphic Design, Travel and Tourism, Sales Demonstration, Sports Management, Sports Marketing, Entrepreneurship, and Job Interview Skills. This event was made possible through the generosity of this year’s sponsors: Adelphi University, Briarcliffe College, Farmingdale State College, Five Towns College, Dowling College, Gundermann and Gundermann Insurance, Astoria Federal Savings, JVC Broadcasting, Oyster Bay Rotary, North Shore Financial Group, Sunrise Outdoor Advertising and the New York Islanders. The distinguished panel of judges included: Michael Agnes, Bank of America; Alex Borg, Borg, Borg and Borg Insurance; Sara Bluestone, Leadership Huntington; Vincent Casillo, North Shore Financial Group; Michael DeCristofaro, Edward Jones; Anthony DeVito, DeVito Group; Christopher G. Erckert, CGE Ventures; Karen Fischer, Home Depot; Patricia Grant, Gundermann and Gundermann Insurance; Camille Savino Koorey, CJ2 Communications Strategies; Maureen Leslie, Adelphi University; Toni Loschiavo, Dowling College; Joe Maddalone, JRM Coaching and Consulting; Jim McGowan, Adelphi University; Christopher Melz, My Own T-Shirts; Bill Mitchell, Huntington Chamber of Commerce; Sarah Novak, New York Islanders; Jennifer Paretta, Bellmore-Merrick School District; Mark Perel, Homestead Window Treatments; Jackie Pevera, Farmingdale State College; Diane Portigiano, Digho; Evan Proios, Briarcliffe College; Anuj Rihal, AXA Advisors; Robert Romano, Farmingdale State College; Morgan Rooney, BAE Systems; Jessica Rosenthal, Saf-T-Swim; Brian Rothschild, Adelphi University; Michael Smith;William Steedle, Farmingdale State College; Jim Werner, Halliday Financial Group and Judy Wasilchuk, Laffey Associates. 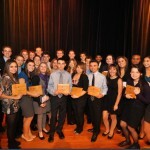 As a division of the Huntington Township Chamber of Commerce, the YPCC was established to engage high school students, college students and young entrepreneurs to enhance their leadership skills in a professional environment interacting with business executives, community leaders, educators and other young adults. The YPCC offers guest speakers, networking opportunities, skill and resume building, entrepreneur workshops, internships and more. We believe that the strength of our School-Business Partnership through the Chamber of Commerce enables us to provide educational initiatives to the dynamic students who are our future business leaders of tomorrow. 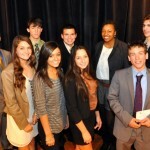 For more information, contact Linda Mitchell at (631) 423-6100, ext.16 or visit www.huntingtonchamber.com.